Now called The Colonnade. Bit of a strange pub, the Doom Bar and Greene King IPA were both in excellent condition, but the overall feel of the pub is of general dingyness and grubbiness. This was one of the first true pubs in Letchworth, which was founded along Quaker values and was something of a 'dry town' until as late as the 1990's. 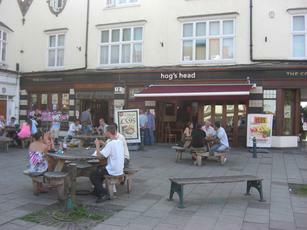 The Arena Tavern opened in the early 90's and then the Hog's Head. When it first opened, it was a nice friendly place with good ale and food. Now its rather like any chain pub. Not exactly bad but not exactly good either. Last time I went there I felt old! seems to draw a very young crowd this place. lived in Letchworth for 21 years and I have to say Letchworth is a crap place to go out drinking! this place has done nothing to improve the drinking image of Letchowrth Garden City!